Upside Down Wine Glass Wedding Centerpiece - Easy Wedding DIY! For this Upside Down Wine Glass Wedding Centerpiece, upside down wine glasses are easily transformed into creative pillar candle holders to be used as glass centerpieces. 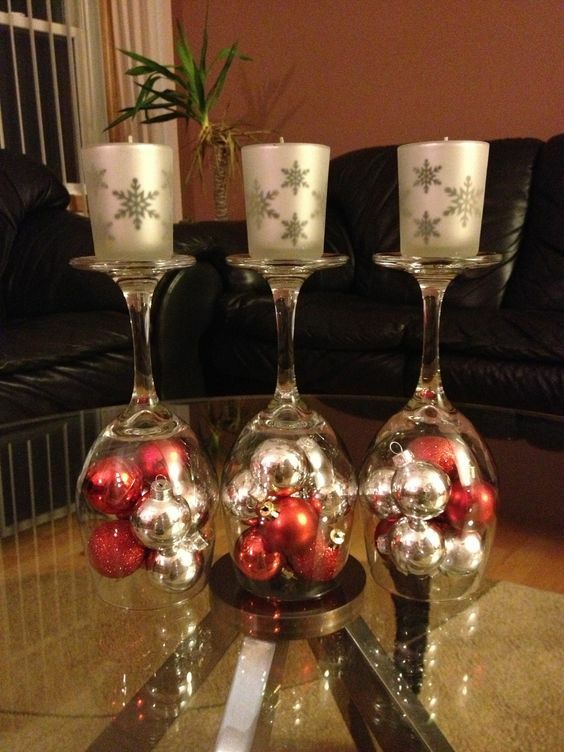 (Scroll down the page to see more ideas for an upside down wine glasses centerpiece). Scroll Down for More Wine Glass Centerpieces and Ideas! Here’s a really beautiful yet, super easy DIY idea for wedding centerpieces. 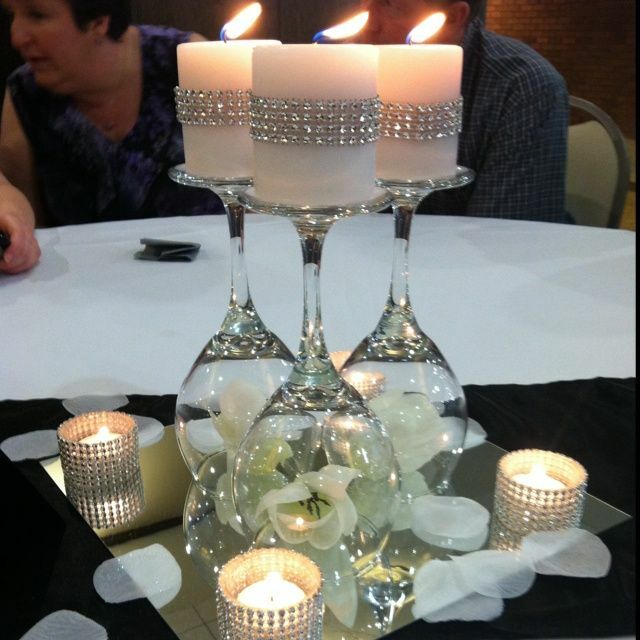 Upside down wine glasses are used… as pillar candle holders! (Photo Credit: C. Fagerlin). What makes this wedding centerpiece idea extra-pretty is the flower detailing inside the glass centerpiece. The flower sits right on the table, with the wine glass acting as a dome around it. 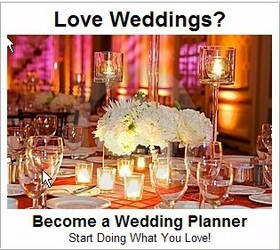 Match the flowers in the glass centerpiece to your wedding colors. 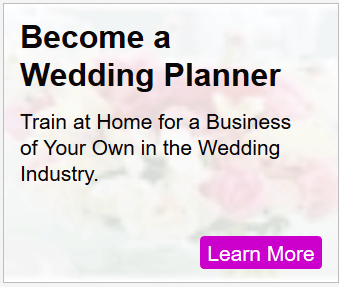 The flowers shown here are silk, but you could also use fresh flowers instead. Just be sure the flowers are kept in water right up until the time they are placed in the glass centerpieces on the tables, and make sure this is done no more than 1 hour before guests are to arrive. Important! 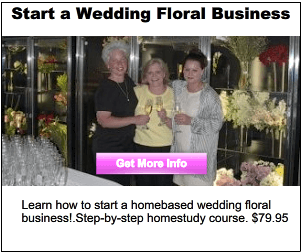 If your reception venue does not have air conditioning, consider either using silk flowers inside the wine glass centerpieces or make sure you use a water tube (available from floral supply stores or craft stores) on the tiny cut stem of each flower to prevent wilting. Clustering three wine glasses/ candle holders together is the best plan – using just one will look a little anemic on the reception tables. To get this look, three upside down wine glasses are grouped together on a square mirror tile. Rhinestone votive candle holders are placed on each corner of the square mirror. A band on rhinestones is wrapped around the center of each pillar candle. Not only are these glass centerpieces gorgeous and glamorous, but the play of light reflecting off the sparkling crystal rhinestones and the glasses is utterly stunning. Carrying on with Holiday season centerpiece ideas, below is yet another twist on the upside down wine glasses centerpiece – this time one of the three glasses is shorter in height, giving a “staggered” effect to the centerpiece. And round floating candles are used instead of pillar candles, for a slightly different look. 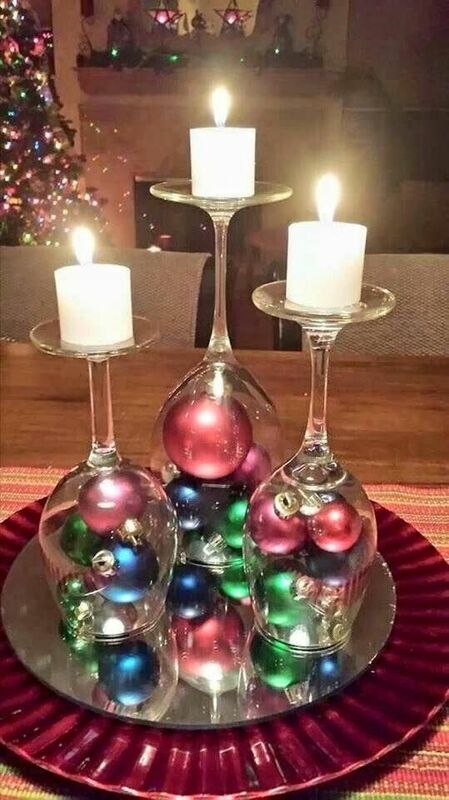 Instead of Christmas balls under the glasses. Amarayllis blooms, a very popular flower at Christmas time, are used. See how easy it is to play with all the different options with these wine glass centerpieces? This Upside Down Wine Glass Wedding Centerpiece idea is one of our most popular centerpiece posts. As you can see, there are so many ways to interpret this wine glass centerpiece design idea. Use your creativity, put your own spin on it, and you can truly make it your own! Making Wine Glass Centerpieces from Rachel Ray – Watch! 15 Ideas for Cake Stand Wedding CenterpiecesWedding Decor for Rectangular TablesEnjoy! Three Stunning Holiday Season Wedding Color Schemes How to Get Free Stuff for your Wedding How Much Liquor for a Wedding?